Tickets have gone on sale for a popular Shropshire air show that was cancelled last year because of the war in Iraq. 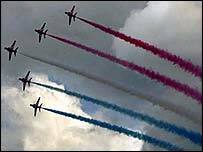 The Cosford Air Show, which normally attracts up to 50,000 people to the RAF base, will take place on 13 June. The organisers said there was a high level of interest in the event, which will feature the RAF Red Arrows aerobatics team. It was not held in 2003 because of uncertainty over whether there would be enough military planes to take part. The organisers said a full flying programme was being drawn up, including a Battle of Britain memorial flight featuring Spitfires, Hurricanes and Lancasters. Tickets are available either online or direct from the RAF Museum Cosford.